Motherhood Imperfected: Unjunk Your Junk Food! We eat pretty healthy in our house. I don't normally but a lot of processed crap, well, I have been more so lately as I the baby must have them but I recently read a book that really opened my eyes in more ways than one. Unjunk Your Junk Food: Healthy Alternatives To Conventional Snacks does just that in help you enjoy your favorite foods but give you better alternatives with more recognizable ingredients. Most of the time, we look at the Nutrition label but ignore the ingredients, which I have found myself doing more often since Brady was born. Sometimes, I don't read the ingredients because I assume that what I'm buying is ok but I can't do that anymore! Brady is obsessed with these. 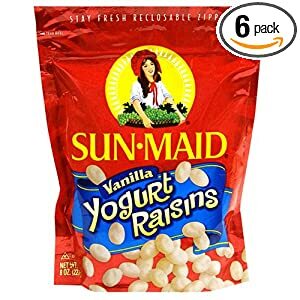 I assumed, dumbly that they were okay since well, they are made from 'Yogurt' and raisins! Well, one of the first ingredients is Partially hydrogenated oil (a trans fat!) and also has Titanium dioxide(a possible carcinogen!) as well as an artificial vanilla flavor. Here I thought, I was giving my kid something decent...ugh! What I took most from this book was what to look for on my own as well. They nailed down 'The Scary Seven' ingredients we really need to avoid! "You don’t have to give up the foods you love, just give up the toxic ingredients. Take the junk out of your junk food." 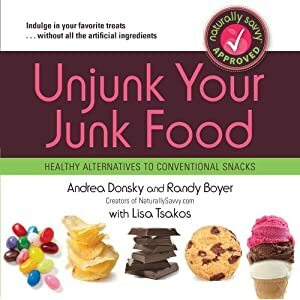 Unjunk your Junk Food can be found at most retail sellers including Amazon and Barnes and Noble or check out Naturally Savvy for more information. Disclosure: I was given this book to read as part of this review but the thoughts and opinions are all my own. I remember reading Michael Pollan's book "Food Rules", and he talked about that we don't have to give up ice cream, brownies, or doughnuts, but maybe we should consider making them ourselves, because we probably won't put forth the extra effort all that often, and when we do, they'll largely be free of the junk. So far, I've been trying to (mostly) abide by that! Great list and book suggestion!